BLAST (Believing, Learning, and Sharing Together) is a new opportunity for youth in grades 7-12 that meets Sundays from 10:20-11 AM. We start the morning in worship and then head down to the Lower Level for discussion. Using a series called "Faith Questions," which is based on questions posed by older youth from around the Presbyterian Church (USA), each week we will look at Scripture and to our faith tradition in relavent, responsible ways. Discussion leaders are Lori Peck, Megan Christian and Kim Downs. 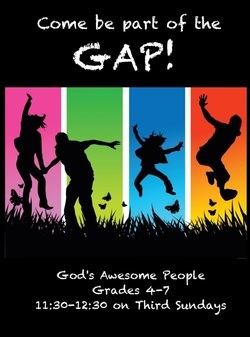 Come be part of the GAP! Designed for youth in grades 4-7 and led by Rev. Adele, Lea Attanasio and Angeles Pai, we meet on the third Sundays of the month (mostly) from 11:30 am - 12:30 pm, and do all kinds of fun stuff together. We've gone apple picking, made rainbow loom bracelets for orphaned youth working with our mission partner in Romania, created Valentines for members of our congregation, baked communion bread for Maundy Thursday, and lots of other cool things. We even have camp-ins overnight at church (which are AWESOME!). GAP is a great way for young people to connect in an unintimidating, welcoming atmosphere. We always read a Bible passage that relates to what we are doing, and talk about what God is trying to teach us. We end each meeting by sharing our highs and lows, and praying together. More than anything, GAP is a place where we learn what it means to have an authentic relationship with Christ and with one another. New faces and friends are always welcome! Contact Rev. Adele for more info. Designed for youth in grades 7-12, we get together twice a month to do things together helping others, whether it's serving lunch at Chapel on the Green, traveling to Philadelphia for some hands-on urban ministry work, sorting items for the food bank, helping build for Habitat, or designing and leading worship on Sunday. We also do some plain old fun stuff, like Escape New Haven. With Rev. Adele and our adult leaders, Mike, Colin and Lynn, we get to know one other while being Christ's hands and feet in the world, and reflect on the impact of that in our lives. 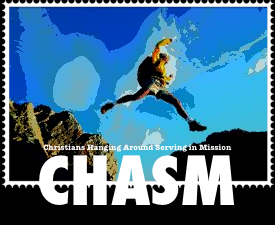 Most of all, CHASM is a safe space to bring our whole selves and our big questions, to grow with God and with one another in meaningful relationships. For the last ten years or so, our high school youth have gone on mission trips together in places around the country. Organized by Group Mission Trips, we go with our youth advisors to a site somewhere within a day's drive and spend the week working to rehab houses for folks on limited incomes. We always have a great time and come home with stories of fun, new friends, and amazing transformation. (You can see pics of our 2014 trip here!) Throughout the year we do various fund raisers to help lower the cost of tuition for our youth. For more information, speak with Rev. Adele or Mike Downs. 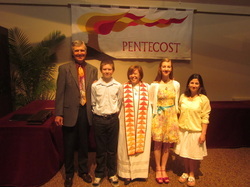 A Confirmation/Commissioning class is offered every other year for youth in grades 8 and above. The program utilizes an eight week curriculum that is experientially based and is taught by Rev. Adele and lay leaders. Each week's class is built around a theme: People of God, Where We Come From, Images of God, Prayer, Sacraments, etc. At the conclusion of the course, students write their own Statement of Faith which they share with each other and the Session. The goal of the class is to be "informed" about the Christian faith and "formed" by experiencing God in community with one another. Contact Rev. Adele for more information.